The objective of the AM36 2007 course was to build an animal-like robot, using Lego Mindstorms NXT, for the RobotsAtPlay Festival 2007. Specific requirements included: Not using wheels for propulsion, some form of interactivity available, and ready in two weeks. 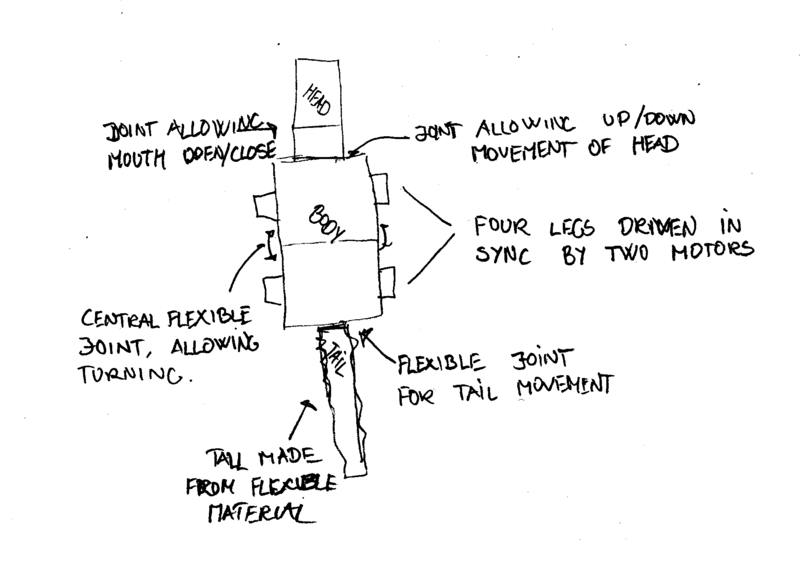 The following drawings were made for the initial design of the robot.The head and body were implemented in the basic style sketched here,while several changes were made to the design of the legs. Additionally, some of the planned sensors were not used, and the activities linked to those sensors not implemented. Head design and a first draft of possible design for legs. Body seen from top. Approximate proportions, and sensor placement. 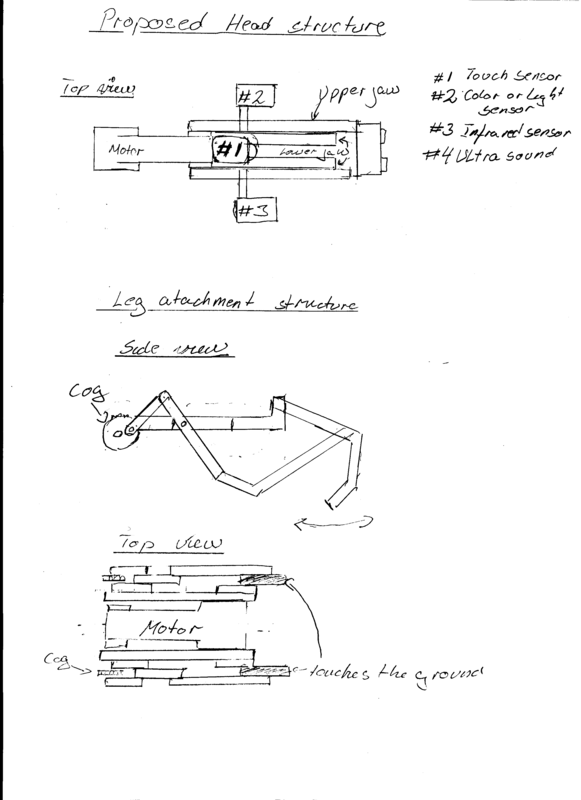 The following sections are the design document containing the original plans for interaction, software, use of sensors etc. The Lego Crocodile is an interactive Lego model, resembling in outlook and behaviour a real crocodile. The model is capable of moving around, either because of activity in its proximity, as well as by its own will. The model will in general remain passive, seeking to obtain a position in the sun, as other animals in the reptile family. Occasionally it will become active, either seeking a better position in the sun, or scavenging for food in its vicinity. The model can also be activated by other animals or humans entering its proximity. Depending on a number of things, including the interval since last eating, the crocodile will attempt to either engage the disturbance, or move to another position to resume sun bathing. To make the robot interactive, the robot processes sensory input simulating sound, sight and touch. The robot will also have additional behaviour patterns, which are driven by a schedule. Finally, a remote controller, using Bluetooth, can activate several functions of the robot.